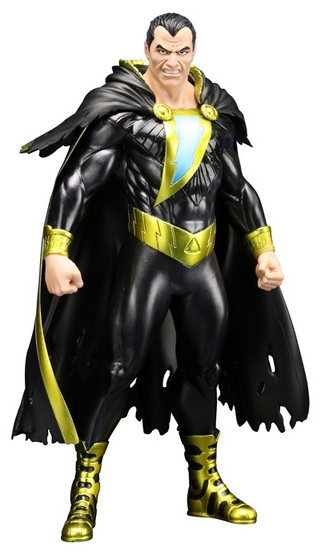 In the post-Flashpoint universe, Black Adam was mentioned by Dr. Sivana while listening to witness reports of the wizard Shazam. Sivana mentions that Black Adam was a slave who was teleported from his prison cell to the Rock of Eternity and granted his powers by the wizard. Adam then went on to save Khandaq from the Seven Deadly Sins before vanishing. During Dr. Sivana's explanation, drawings of Black Adam are shown in a historical text, displaying a slightly different look from his previous incarnations. Dr. Sivana later uses his new-found magic eye inside of some ruins to read a magically hidden hieroglyph that makes the wall explode, releasing Black Adam from his tomb. Adam is then shown in a revamped version of his original costume, which includes a cape, hood, and a metallic belt instead of a sash. His lightning bolt appears as an opening into his body with magical energy visibly inside of him.